Devoted to Social, Ethical, Psychological and Occult Studies. Directory of Societies Meetings Lectures Etc. 1/1, September 1910-2/10, June 1912. 50 cents a year, 60 pp. The journal was put out by the Mystic Light Library Association on John Street in Manhattan, with vast lists of books available at the Association's reading rooms that could be rented for 30 days for 10 percent of their sale price, with an additional 5 percent for 30 days more. It reflects the transformation of Colville (1858/1862-1917) from a spiritualist medium into a New Thought occultist. It is related in some way to Mystic Light, a more Masonic journal, which also carried articles by Colville. The journal featured regular announcements of Colville's lectures at the Association, as well as articles by or excerpts from him, Max Heindel, Elbert Hubbard, Julia Seton Sears, J.D. Buck, "T.K.," Ella Wheeler Wilcox, Anita Silvani (on "The Strange Story of Ahrinziman"), and others, lists of New Thought and Theosophical meetings around New York City, and advertisements by the likes of Mrs. J.H.R. Matteson of Buffalo ("One of the Most Conspicuous Clairvoyant Doctors for the Past Thirty Years") and Henry Clay Hodge's Science and Key of Life. 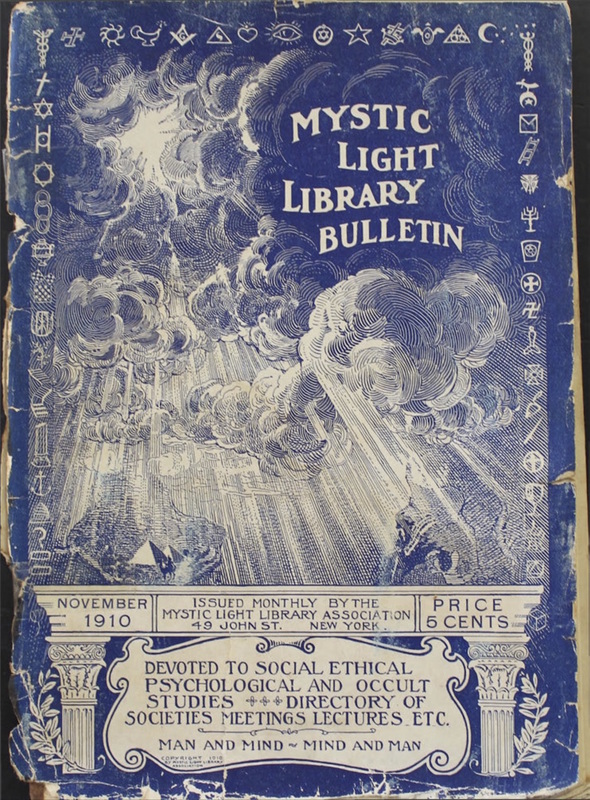 Most notably, the journal carried biographies of important figures in the occult, spiritualist, and New Thought movements of time, complete with portraits, including Annie Besant, Marie Corelli Arnold Bennett, Orison Swett Marden, et al. The final issue noted that the library would be continued but that the subscriptions to the journal would be fulfilled by Mrs. Dora Morrell's The Uplift in Baltimore. ATLA microfilm; LOC; Yale University; Skidmore Library, Lily Dale (1 issue).